What could possibly be better than combining USA’s most iconic historic sites with award-winning beer? Nothing! Tap into Philly's legendary history along with its epic beer scene on this adventure through Philly's major landmarks and into its famed bars, pubs, and microbreweries. Make a toast in Philadelphia's oldest pub, sample craft brews, and learn why Philly is one of America's best beer cities. You’ll start your Philadelphia tour at our local office, where you'll meet your guide and see some great local art and photography inside this historic space. Outside, we’ll see the Betsy Ross House and hear stories of the birth of the American flag. 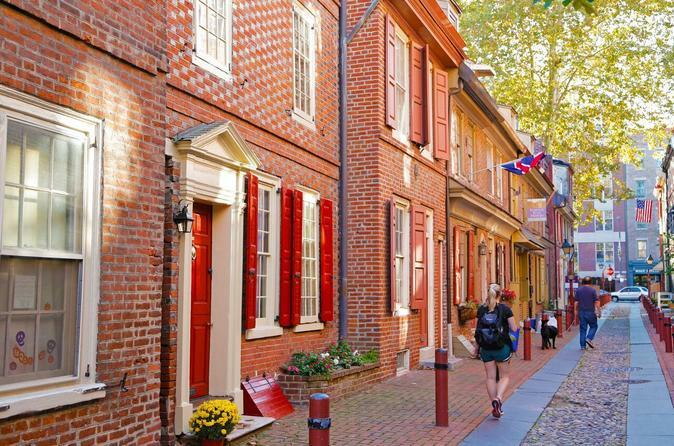 From there, we’ll weave through the charming back alleys of Old City, and walk down the oldest continuously occupied residential street in the country. As you walk through Old City, you’ll get a taste of this vibrant neighborhood and pass some of the trendiest pubs, clubs, cafés, and shopping in Philly. You'll also get a chance to see some great art galleries and fantastic historic, industrial architecture along the way. You'll also get some great views of the site of Ben Franklin's home as the tour continues through Philly’s Historic District. Past Franklin Court, you’ll be greeted with views of Independence Mall, the National Constitution Center, and the U.S. Mint. Walk across the Mall and into the President's House Site, home to George Washington and John Adams during Philly's tenure as our nation's capital. From there we pass the Liberty Bell, where we might get a chance to go inside for pictures. We then continue to a spot where (on weekdays only) we can grab a view of Maxfield Parrish's Dream Garden mosaic mural. Then off to Washington Square for stories of William Penn and possibly a visit to the Tomb of the Unknown Soldier. We’ll continue through Independence National Park and the must-see front yard of Independence Hall, site of the signing of the Declaration of Independence and the US Constitution. Your guide will also share knowledge of Congress Hall, Old City Hall, the Philosophical Society, the Second Bank of the US, and Carpenter's Hall. Then it’s time for happy hour! We’ll travel by subway to the very heart of modern Philadelphia, City Hall, and step out onto the streets of Center City Philly, where we'll discover some of the sights and sounds of Philadelphia as people are finishing up their workday. At this time of day, many a Philly local will be bee-lining for the closest happy hour, and we'll do the same! We’ll have the option to visit the oldest continuously operating bar in Philadelphia, a classic dive bar, an Irish pub with local flair, a modern beer café, and many other neighborhood bars and pubs. At each location, we'll talk about the history of these bars and why they are so popular. One drink at each bar is included with the tour, as well as a pub or street snack. And the bars we visit all have one thing in common: a taste for Philadelphia's local craft beers and breweries! You'll quickly find out why Philadelphia is one of America's best beer cities, and learn the names and tastes of brewers such as Philadelphia Brewing Co., Victory, Yards, Troegs, Flying Fish... From our final pub, you’ll be able to continue on your own Philly beer journey or grab some dinner at one of Philadelphia's many great restaurants nearby.